High Octane Adventures with Team Tactics – Shaken not Stirred! Team Tactics welcomed a group of American delegates to the UK last week, providing them with an unforgettable London team building experience on the River Thames, with a special twist. There are many famous literary creations from the UK ranging from Sherlock Holmes to Harry Potter, but arguably the most famous of them all is James Bond. 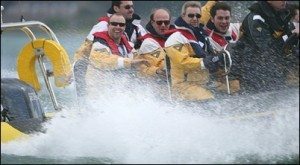 Our extremely popular Shaken not Sitrred Thames Power Blast event is fast becoming a favourite, especially for welcoming overseas visitors looking for original corporate events with a quintessentially British theme. 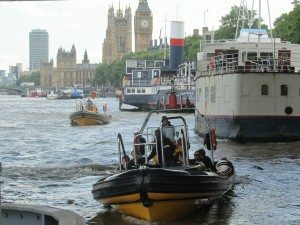 Shaken not Stirred sees guests climb aboard a fleet of RIB’s (Rigid Inflatable Boat), used by Special Forces such as the SAS, for an exhilarating event that allows them to see London from an entirely new perspective. A truly superb event, Shaken not Stirred treats guests to extreme formation changes and high speeds aboard the 225HP RIB’s, as well as putting their Bond knowledge to the test with a trivia quiz. Our expert skippers have years of experience navigating the historic Thames and will guide guests through the journey past iconic monuments such as the O2 Arena, London Eye, Big Ben and of course the MI6 building! Soon we’ll be welcoming a group from Russia to London with this fantastic event. As an extra special touch to the event we’ve also arranged for a James Bond impersonator to appear along the route! There’ll be more pictures of the event as always on our Facebook page.